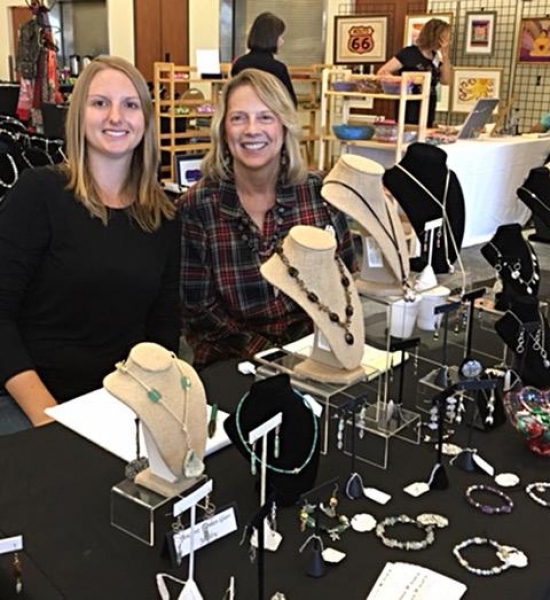 Event Description The San Dieguito Art Guild presents its eighth annual Holiday Bazaar. Come enjoy yummy treats, raffle, silent auction, and art for sale by artists: paintings, jewelry, photography, glass, ceramics, mosaics, fiber art, cards, prints & more. Admission to the Bazaar and ample parking are free. The Guild, an over-200-member all-volunteer nonprofit organization that operates the Off Track Gallery located in the Lumberyard Shopping Center in Encinitas, serves the community by frequently offering art workshops, classes and demonstrations by outstanding professional artists. Run by a board of 15 elected Directors, SDAG was organized in 1965 by a group of artists for the purpose of promoting greater understanding and appreciation of the fine arts. Carol Korfin, one of the event organizers, says, “This event gives local artists a venue to offer their hand-made items to the public. And gives the shoppers a chance to purchase one-of-a-kind artworks, which cannot be found in the malls. There are no imported items at this Bazaar. In addition, the buyer is purchasing work directly from the artist and can meet them face to face.” Guild President Linda Melvin says, “Even if you have been to our Holiday Bazaar in the past, there are new artists and new items to see. We try to have a balanced mix of medium, so you will find photographers, watercolorists, oil or acrylic painters and as well as multi-media artists.” There will be a Silent Auction of artworks donated by the participating artists. Karen Fidel, ceramic artist says, “Our artwork is special because it is from all local artists and often of local scenes. Our Bazaar features really special deals on silent auction items where the proceeds help support our Off Track Gallery.” For more information go to OffTrackGallery.com or call 760-942-3636.